Moving to a new town can be hard enough when it comes to making new friends, but we all can agree that one of the greatest ice-breakers is deciding which superhero is the best. In the outstanding short titled, “Super,” Rio Mangini, who plays the role of Roy, and Mason Cotton, who plays the role of Billy, decide which one of their superheroes is the greatest, and no, it’s not your average Batman vs Superman type of convo – it’s a battle between two superheroes the boys have created themselves with a whole combination of epic superhero abilities. The short is so magnificently done and from the acting of both actors to the spectacular animations, it’s something that you’ll just want to watch over and over again. “Super,” which is about five minutes in length, has so much action, fun, adventure, and incredible, creative animations that brings everything to life. “Super” is so enjoyable to watch and you forget that it’s only five minutes long because it’s filled with pure brilliance. Anyone who watches it can see how much effort was placed into creating something as extraordinary and magnificent as this. Rio Mangini hosted a special screening of “Super” recently which I, Alexisjoyvipaccess had a wonderful time attending. It was so amazing to see how much exuberant energy both Rio and Mason Cotton brought to the short and they effortlessly brought their terrific acting talents to make it seem like they were not acting but they were just two boys discussing some awesome superheroes. In addition, the animations truly left me in awe. 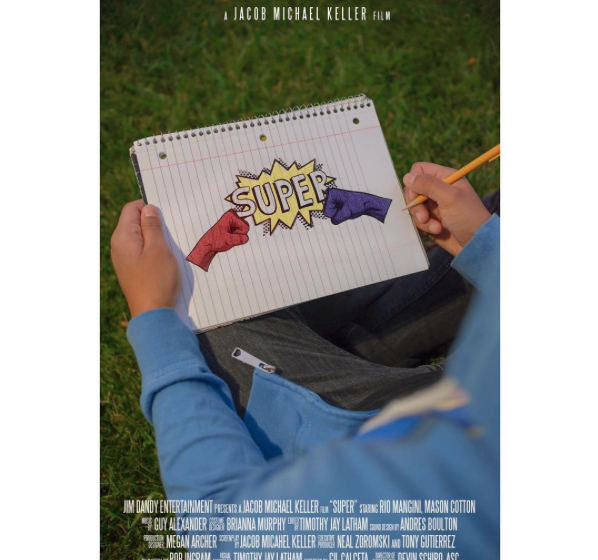 Writer Jacob Michael Keller did a sensational job with “Super” and we can’t wait for this short to make its rounds to all of the upcoming film festivals and have this spectacular work of art be shared with many more people. I can definitely say that I’m looking forward to seeing more of “Super” and hopefully some sequels that Jacob Michael Keller will add his phenomenal talent to to bring more superhero fun to this world. Here at Alexisjoyvipaccess.com, I’d like to send a big congratulations to Rio Mangini, Mason Cotton, and Jacob Michael Keller on such a marvelous short! Previous Article: Worldwide Phenomenon DVICIO Looked Dapper At The 2016 Latin GRAMMYs! Next Article: Get Ready To Slay The Fashion Game As Rules Of Rhiannon Just Launched Its Clothing Site!